In 1867, before Murray was actually a town, the people of the outlying area saw the need of the organization of a Methodist Episcopal church. Mr. and Mrs. Hullum Scott made arrangements with Rev. John Dailey of Osceola, who was called a "circuit rider", to come to the Pennal school house in Troy township (about one mile from the present town) and organize a Sunday School and hold preaching services. It was part of the Hopeville circuit. There were fourteen charter members including H. Scott, A.E. John, Isaac Burt, Abel Dufur, J.E. Day, Jed. and Elijah Knotts and their wives. The next year, 1868, the railroad was built and the town laid out. The following spring this group of Methodists moved from the Pennal school house to the railroad warehouse located in the present uptown park. In 1870 the Baptists built the first church in Murray, and the Methodist group was invited to worship with them. In 1873 the first Methodist Church was built at a cost of $2,800. 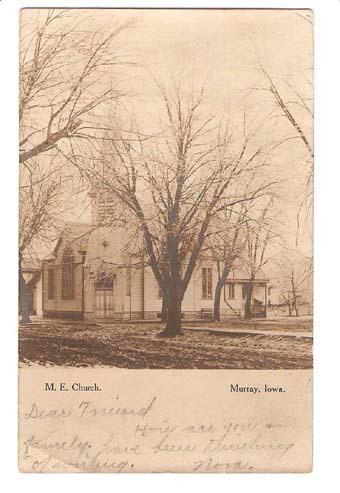 The church stood across the street southwest of the present location. The first pastor was Reverend Sparks, and the first organizst was Lulu Scott. Membership totaled 130. The parsonage was located two blocks east of the uptown park and was later moved east of town for a tenant house. 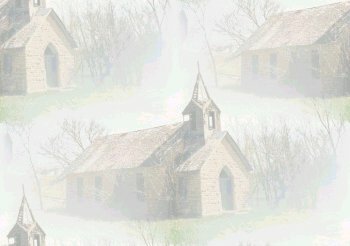 This church served the people 21 years until they outgrew it. The second church was built on the corner where the present church stands. It was built in 1894 at a cost of $3,500. Richard W. Matheny was the last pastor of the first church and first pastor at the second one. Mrs. O.E. Garrett was the organist and Mrs. Elizabeth Dufur was an early Sunday School leader. Reverend Wickersham preached the Dedicatory Sermon. Early pastors included: John Dailey, Frank Reed, Sparks, Charles Watson, Hughes, James Conrad, Horace Deshler, D. Austin, A. Hancox, C.C. Hover, J.E. Nichol, Charles W. Stuart, J. W. Bott, Fred Sheldon, R.W. Matheny, John F. Gibson, and W. L. Douglass. Thanks to Patsy Lokker for sending this picture of the Methodist church. Sources: Clarke County History, Murray Centennial, Murray Quasquicentennial 1868-1993: Where the past and present meet.